I read this article and found it very interesting, thought it might be something for you. The article is called In Life and In Baseball: Embrace the Triangle and is located at https://teamperformanceus.com/2015/07/embrace-the-triangle/. Look around you. Triangles are everywhere. You will find them in bridges, buildings, in the frame of a bicycle and on the playground. Triangles bring strength to structures. Why? Triangles form incredibly strong structures because all three sides bear the load. It is the teamwork that makes them strong. Baseball is the ultimate team-building opportunity. This summer, I was chatting with my niece about her son Josh’s experience on his new baseball team. She shared stories about Josh and his team, and I began thinking about how the “triangle” the team of nine year olds had in place was one of the key reasons they were having a successful season. As I practice and train others in Patrick Lencioni’s Five Behaviors of a Cohesive Team, I am reminded that effective teamwork is the competitive advantage. Why did this team of nine year old boys have a great team? It has little to do with the number of wins; it has everything to do with the methods they used to build the team. Josh was on a new team, made up of “free agents.” The coach was leading a team for the first time. On the first day they met, he shared his goals for the year and they shared theirs. Some were worried that they had never played before; some had low confidence in their abilities and others feared failing. During that first meeting, the team and coach discussed their history and goals. All agreed that despite their past experiences the collective goal was to learn the game, be okay making mistakes and have fun. When team members are transparent and honest with one another, they build trust. 2. The team could engage in conflict around ideas. During practice the boys were on the field debating sliding with the coach. He asked them not to slide during games because a) it really isn’t necessary and can slow a player down and b) it is unsafe unless you know how to slide properly. The boys were up in arms over this request and continued to give the coach scenarios where sliding might be needed. They talked about major league ball players that used the slide effectively. He calmly listened and even offered to practice “safe” sliding during the next practice and made it clear that sliding was strongly discouraged. The team was satisfied with the promise of the sliding lesson, the coach felt heard and conflict was handled in a proactive way. When team members are able to debate ideas constructively it builds trust. One of the first decisions they had to make was choosing a team name. It took place over three practices. All team members submitted ideas. Then they were told to go home a think about it. During the second practice, they narrowed it down to three team names and were told to go home and think about it again. At that third practice there was a final vote. The Gladiators felt a sense of pride and ownership in their name because they had chosen it- together and with much thought. There was no complaining or pouting because they were an active part of the process. When team members can offer opinions they are more likely to commit to decisions for effective team growth. During the first few weeks, team expectations were established. Be on time, come to practice, be ready in the field, bring your equipment, encourage one another, listen to the coaches, show respect to the other team. The boys were often heard encouraging and reminding one another to follow those established rules during practice and the game. They knew what to do because the expectations were clear. Each boy wanted to do the right thing so that he could be a part of the culture. When there is a clear plan of action and goals, accountability is more likely. The goal was to learn the game and have fun. When all was said and done they did just that. The team skills and cohesiveness grew immensely in a short 8 week period. Each boy loved being a part of a team where they trusted one another, felt safe to speak up, debated ideas, and were accountable to the coach and one another. 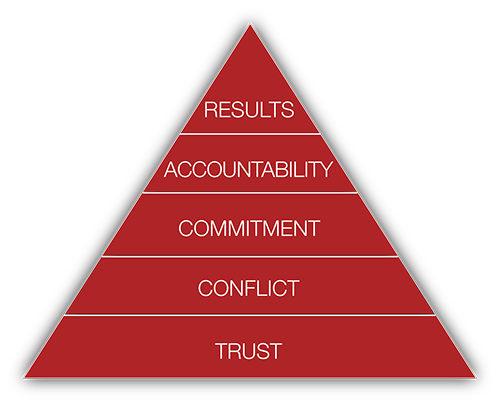 In building trust, conflict resolution, commitment and accountability – results followed. The Gladiators had the advantage. They developed the five building blocks to teamwork as defined by The Five Behaviors of a Cohesive Team. The triangle they established and embraced propelled them to victory in their collective goals: to learn the game, respect one another and have fun. Really, in life and baseball that is what it is all about. Are you ready to get started in gaining more bench strength using the Five Behaviors of a Cohesive Team? Contact me to take a quick assessment and see if the Five Behaviors of a Cohesive Team is right for you.